Sunday is two sermons in one! Peter's sermon at Pentecost as a Gospel Primer for the church and for us. That we would be primed for life together, on mission, for the glory of Christ. Come through, Sunday at 10 am. Del Norte High. 16601 Nighthawk Lane, San Diego. A People of Prayer - We are encouraging everyone to turn in a prayer card on Sundays and to seek out people in the church to pray with! We truly believe Jesus desires for us to be a people of prayer so let's petition him on each others' behalf! You can also now submit prayer requests on our website by clicking "Prayer" in the navigation bar. Family Sunday and Prayer Service - October 1 we will have a family service (all children in the auditorium) and prayer service. The schedule will include musical worship, a reflection from Acts 2 and intentional time of prayer. We will be prayer for healing, safety, families, marriages and a slew of other things. Let the elder know how we can pray for you ahead of the service and we will have the congregation pray. This will also be a great time for family communion. Small Groups - We have a number of groups meeting in PQ, Poway, Escondido and Carmel Mt. Let us help you find a group! 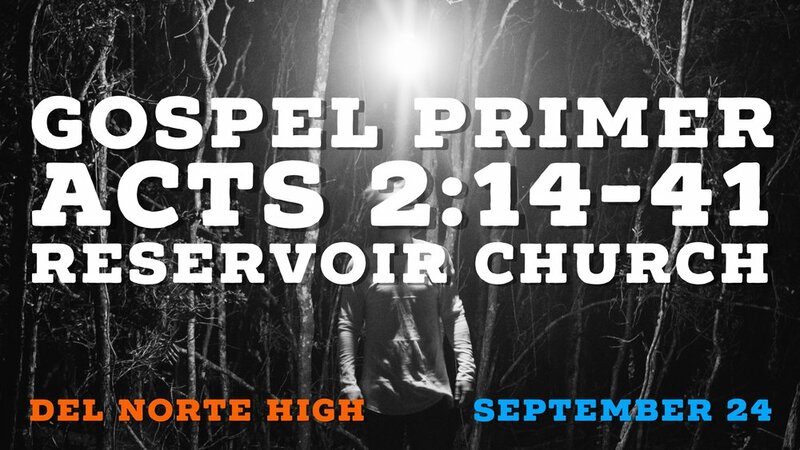 Email jonathan@reservoirchurchsd.org for more info.